One year ago at the Sundance film festival, Zach Braff’s indie dramedy Wish I Was Here debuted, accompanied by a fair amount of pre-screening hubbub. The film was already controversial, because of writer-producer-director-star Braff’s decision to finance a good chunk of it via Kickstarter. But Braff was also one of Sundance’s great success stories, having scored a hit with his movie Garden State after premiering it at the fest in 2004. 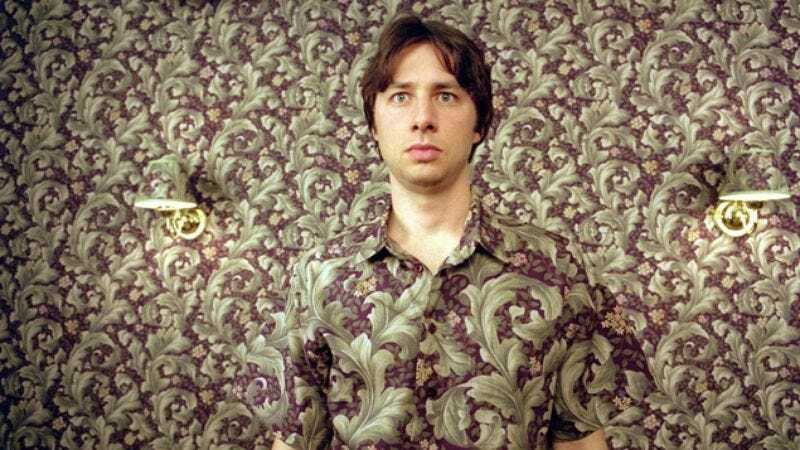 Garden State had practically become the model for a certain kind of Sundance film: the quirky, earnest, personal project from an actor stepping behind the camera for the first time. So the first Wish I Was Here screening at Sundance was as much a belated pat on the back for Braff’s first film as it was a celebration of his latest. Wish I Was Here didn’t receive the kind of warm reception that Garden State got. While it had some supporters, it met with far more loud howls of derision on social media after that premiere, and then weathered an early round of scathing reviews. It’s as though critics were lying in wait—not just for Braff, but for this whole sub-genre of American independent film. Honestly, I can’t blame my colleagues, because Wish I Was Here crystallizes a lot of what’s irksome about these kinds of aggressively adorable indies. Braff plays Aidan Bloom, a 35-year-old actor who home-schools his sixth-grade daughter Grace and her younger brother Tucker when the family can no longer afford private school tuition. On the first day of “class,” Aidan asks his kids what they’ve been studying in school, and when Grace says, “Geometry,” Aidan draws a triangle on a sheet of paper and asks her and Tucker to identify the shape. Grace heaves an exasperated sigh, and informs her dad that she’s in Honors Math, and has been learning things like supplementary and complementary angles, and how to calculate circumferences. The point of this scene is to show that Aidan is in over his head, and that he’s half-assing being a teacher just like he’s half-assed so many other things in his life. Yet what sticks out to me isn’t Aidan’s slackness, but Braff’s. Leaving aside that Grace’s curriculum sounds a little basic for sixth grade Honors Math—it’s as though Braff just Googled “geometry terms” and went with the first few that sounded age-appropriate—the whole premise of the scene is stupid. Even given that Aidan is supposed to be somewhat of a dope, what kind of dad makes a big plan to teach his own kids and then doesn’t prepare anything? Why wasn’t Aidan’s wife Sarah (Kate Hudson) on his case more? And in the 2010s—an age when schools send out texts and set up websites to keep parents apprised of what their kids are up to—why doesn’t Aidan have any idea what his children are doing? I get that Wish I Was Here is a comedy, not a documentary. But Braff’s also trying to say something meaningful about how a family crisis can force even a committed goofball like Aidan to start taking life more seriously. In an effort to make that message more palatable and funny, Braff reveals either an outright ignorance or a general lack of interest in how the real world works. And that’s a problem, because Wish I Was Here means to reveal essential truths about that world. It’s hard to trust a pontificator who can’t be bothered with the particulars. I don’t mean to pick on Braff here, because he gets slammed enough, and often unfairly. I think he’s a well-intentioned guy, with a unique screen presence and real talent as a visual stylist. I like Scrubs. I even have fond memories of Garden State (though I haven’t seen it since it came out). But I see too many independent films every year that are like Wish I Was Here: phony and faux-profound, and filled with recognizable actors who make the project seem even more like a fiction, divorced from real-world relevance. Not all are bad. Some indie filmmakers, like Joe Swanberg and the Duplass brothers, have built substantial careers out of telling stories about regular folks muddling through their lives while hamstrung by hazy feelings of dissatisfaction. After a while, though, the sheer preponderance of these cutesy Amerindie movies about arrested adolescents—and other people with non-problems—starts to become numbing. Aside from Garden State, a possible Patient Zero for the mushy indie dramedy trend is another Sundance hit, Little Miss Sunshine—an Oscar-winner that represents American independent cinema in default mode, pumping out mildly absurd slices of life populated by eccentrics and childish adults, mostly played by stars calculatedly working against their usual type. Little Miss Sunshine’s plot—which sees a family of misfits hitting the road to take their youngest member to a children’s beauty pageant—features fake characters in a scenario that’s baldly contrived, leading to a climactic pageant sequence that has no foundation in what pageants are actually like. But the movie is sweet, and ultimately uplifting, so it wins over audiences, who don’t care so much about phoniness if it feels true. The main issue I have with these neither-here-nor-there indies though is that there’s already a genre perfectly well-suited to revealing truth through absurdity: It’s good old, unadulterated comedy. What does a belated-coming-of-age indie like the 2014 Sundance offering Laggies have to say about adults who won’t grow up that isn’t said just as well—and much, much funnier—by Adam McKay’s Step Brothers? In its own way, Laggies is just as broad as Step Brothers. Director Lynn Shelton and screenwriter Andrea Seigel tell the story of Megan (Keira Knightley), a woman who can’t commit to anything; and they stick Megan into a goofy plot that sees her ducking her boyfriend’s proposal by moving in with a teenager she just met. Laggies’ approach is more straight-faced, inviting more scrutiny about how accurately it’s depicting people who approach 30 with no firm relationship or career plans. Step Brothers, by contrast, has no pretensions of realism, and can be as ignorant as it wants to be while focusing on the same kind of crisis of maturity. Or compare Knightley’s Megan in Laggies to Anna Faris’ Christy Plunkett in the CBS sitcom Mom. The two characters are roughly the same age, but where Megan has spent a privileged adulthood trying to find her passion—by slacking off, essentially—Christy is a recovering addict with two kids who works as a waitress at an upscale restaurant, where she doesn’t make enough to cover the rent on her modest house. Mom isn’t as “cool” as Laggies: It’s a three-camera, live-studio-audience mainstream sitcom, with unapologetically outsized characters and situations. But in the year-plus that Mom has been on the air, it’s dealt more honestly and amusingly with one youngish person’s credibly chaotic life than either Wish I Was Here or Laggies. Obvious Child isn’t a flawless film, by any means. But it’s funny and honest, and it’s frequently as poignant as Wish I Was Here wants to be, without trying so hard. More importantly: When I watched Obvious Child, I never felt that Robespierre and Slate didn’t know what they were talking about. They’re not dealing with life in the abstract, and they’re not afraid of losing the audience if they don’t pepper every minute with a kooky moment, a laugh-line, or a life-lesson. Festival catalog descriptions are notoriously dispiriting, so it could be that all of the above will turn out to be brilliant. At the moment, they seem to be pitched to the kind of person who like their indies soft and familiar. I hope that’s not the case. I hope these films won’t be like Wish I Was Here: drawing a cartoon and passing it off as a portrait.